Today marks the end of my series on Gimp, so of course I have to close out with a combination of my favorite things — keyboard shortcuts and cheat sheets! 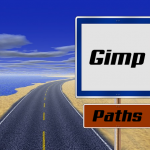 Gimp, like most programs, utilizes many (120+) keyboard shortcuts to make its use very quick and simple — assuming you can memorize enough of them! In addition to the standard shortcuts — which are re-iterated in this cheat sheet, for convenience, despite the fact you’ve hopefully memorized them already! 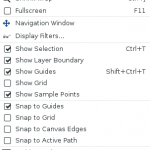 — there are a number of shortcuts that quickly select tools, dockable dialogs, menu options, and more. 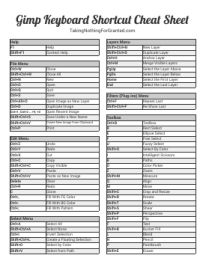 The Gimp Keyboard Shortcut Cheat Sheet is free to my mailing list subscribers. Gimp plugins that alter images in some way — although usually just the single active layer — are called filters. Filters is a broad definition that can also include plugins used for other purposes, that do not alter images. Filters and plugins are considered separate from the Gimp core, and — in theory — should not affect the core functionality of Gimp itself. 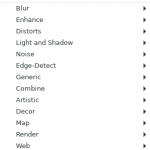 Plugins are found throughout the menus in Gimp, while there is an entire menu devoted to filters, as over 100 filters come installed with Gimp. New filters and/or plugins can also be added, and although the Filters Menu is the default location for filters to be added, some may appear in other menus. In fact, many plugins can already be found — by default, with the initial installation — in other menus. 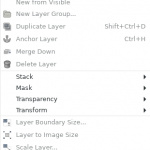 The layer menu contains nearly 50 commands that are essential to working with layers. The new layer command opens up the dialog box from which you can specify details (name/size/fill type) to create a new layer. In previous posts on the subject of Gimp and/or image-editing, I have alluded to layers, but without much detail. Today is the day when details will be revealed as I peel back the cover, layer by layer… ok, too corny, let me start over. Image layers can be visualized as transparent images, all stacked one-on-top-of-the-other within a single image. Layers are incredible tools that can be added, removed, made visible/invisible, re-arranged, and much more, all with just a few clicks of the mouse. The design possibilities are endless. Well, almost endless. Gimp’s image menu includes commands that affect the entire image in one way or another, as opposed to only parts/selections/layers/etc. 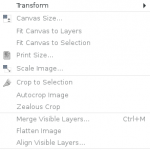 Gimp’s transform tools — covered briefly in my post about the Gimp Toolbox — are, for the most part, closely related to the tools found on the image menu, but since they are mostly easy to use and self-explanatory, we’ll not cover them in more depth right now. We will focus instead on breaking down the commands on the image menu, and figuring out what makes each one tick — or tock. 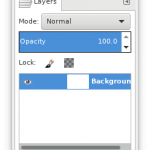 Gimp’s view menu includes commands that affect visibility and appearance of images and the Gimp interface. Note that each view is still of the same images; changes to one view will be made in the other views, whether or not that part of the image is in focus at the time or not. 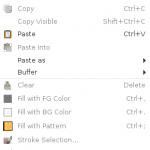 Gimp’s Edit Menu is full of both the standard options found in edit menus, and commands unique to image-editing. Since many of these options are very helpful, it’s a good idea to at least browse through the options available, in hopes of recalling them later when they are most needed. Today’s post is an overview of the commands found on the edit menu. Image selections are “frames”, characterized by animated dotted lines, that can be used as guidelines to create content or edit the content inside the selected area. 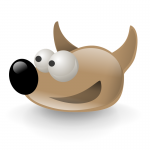 Gimp offers a combination of seven different tools that make selection quick, painless, and precise. You may remember that I already broke down the basic purpose, or description/use, of each tool in a previous lesson, but there is much more to learn about the use of each tool. Let’s begin with a recap of the available selection tools, along with a few more of their capabilities. Paths made via the path tool use Bézier-curves to allow you to make elaborate designs. Paths can either be “stroked” (have styles applied along the paths) or they can be used as a method of selection (in place of the rectangular/ellipse/free/fuzzy/foreground/color/scissors select options). Paths are deceptively easy to use, and quite useful, so they are today’s subject of choice. Let’s jump right in! 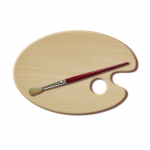 Gimp’s four basic paint tools — pencil, paintbrush, airbrush and the ink tool — are lumped together in a category that also includes the bucket fill, gradient, eraser, clone, perspective clone, heal, convolve, smudge, and dodge/burn tools. These all work together in similar ways to draw, paint, and/or similarly modify an image. You may remember that I already broke down the basic purpose, or description/use, of each tool in a previous lesson Exploring the Gimp Toolbox, so this time we’ll focus on the paint tool options, shortcuts, etc.